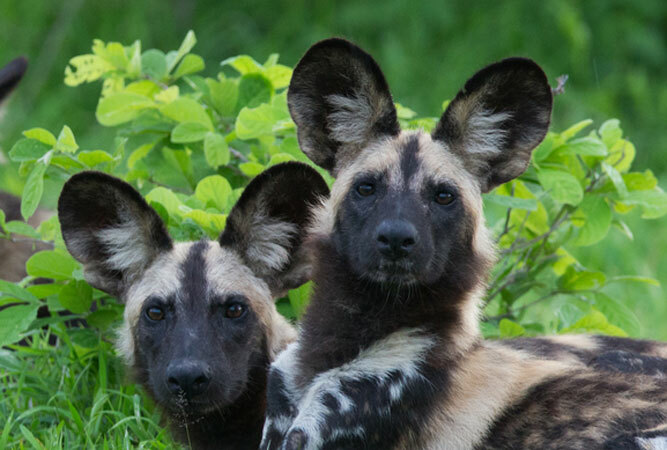 Probably the most distinctive feature of African wild dogs is the big, round ears. They’re nothing like a domestic dog’s. They’re nothing like a wolf’s either, yet this beautiful Cape hunting dog, or painted dog as it’s also known, is given the Latin name Lycaon pictus, meaning ‘painted wolf-like animal’, because it is closest in nature to a wolf. Their hide is different from a dog’s too – covered with irregular patches of black, brown, red, white and yellow fur. 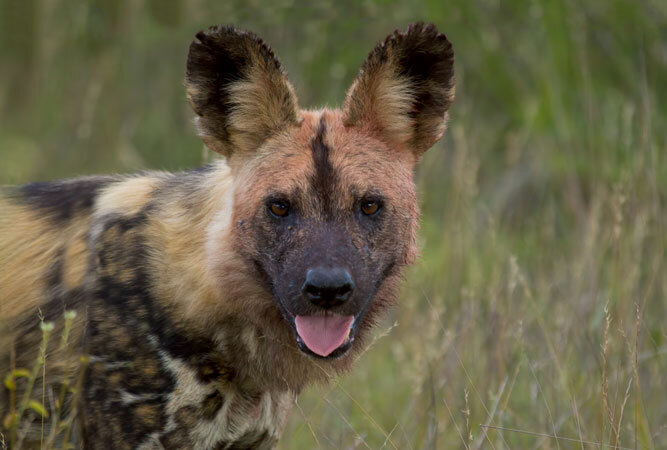 Wild dogs have a black, furrow-like vertical line on the forehead between the eyes that is rather endearing. And they have only four toes per foot, unlike the five toes of domestic dogs. You no longer find them in North or West Africa, and their numbers have been greatly reduced in Central and North East Africa too. In South Africa there are fewer than 400 free-ranging wild dogs left – 130 of them in the Kruger National Park, and 160 in KwaZulu-Natal. Globally, there are only 6 000 wild dogs. To further add to their dire status, game reserves are not keen on having them – wild dogs are not commercially viable (visitors come to the see the big 5), and a pack of six wild dogs can eat as many as 300 small antelope a year. A highly sociable creature the wild dog lives in packs that share food, hunt cooperatively in groups of up to 20, and collectively rear the litter of the monogamous pair that leads the pack (the dominant female is usually the only female to breed because there is not enough food to feed more than a litter at a time). Their social structure is similar to that of the wolf, with stronger social bonds than either lions or spotted hyena. Not only are their numbers greatly diminished, but wild dogs also tend to cover great distances (they expend more energy than border collies) and are thus difficult to find. During the denning season, however, they stay in one place for up to three months (this is usually September through March). 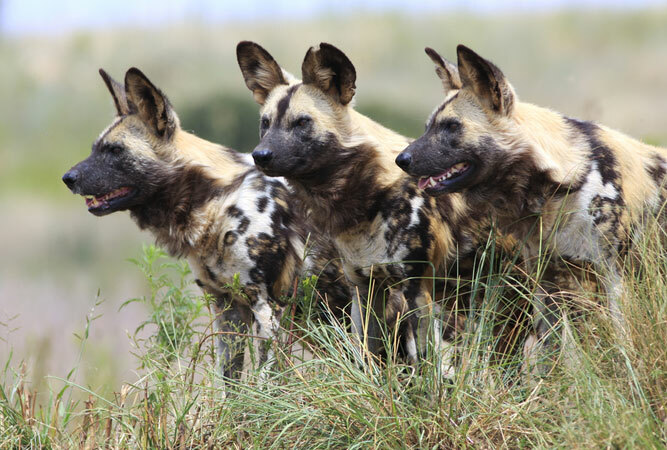 Introduction of the wild dog began back in 1980, when 22 wild dogs formed a single pack. To further strengthen the population more dogs were introduced between 1997 and 2008 so that the population now is around nine packs. Hluhluwe-iMfolozi has the largest wild dog population in the province, although reserves like Mkhuze, Hlambanyathi and Tembe have also introduced them. The reserve tracks and monitors wild dogs on a daily basis. The Venetia Limpopo Reserve, set in the sandstone cliffs and upper reaches of Mapungubwe National Park, runs a wild dog project allowing visitors to radio-track the wild dogs with the researchers. Almost 90% of the tracking attempts result in a sighting of the pack but, given the nature of the project, there are no guarantees. Wild dogs were originally introduced into Pilanesberg in 1998, where they have successfully survived, and continue to breed. The pack of 13 wild dogs is collared with satellite collars, which has allowed the project to learn that the pack uses the reserve’s fence as a way to lure and capture their prey, and to avoid lions. The pack is not often sighted as they tend to steer away from tourist roads. 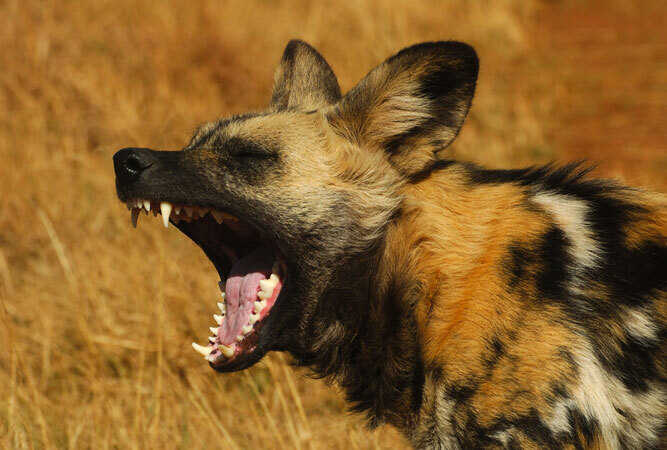 Since 1989 the wild dog has been the focus of a long-term study project, sponsored by the Endangered Wildlife Trust. 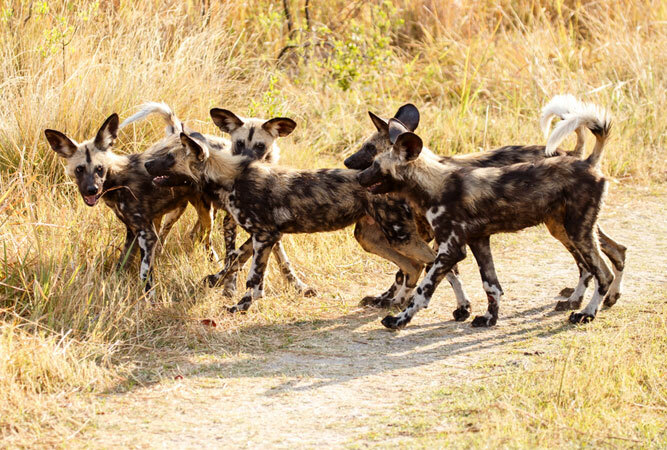 Regarded as the country’s only viable population of wild dogs, the population fluctuates between 200 and 400 dogs at any time. The packs, for there are several, use an area of between 400 and 900 square kilometres. 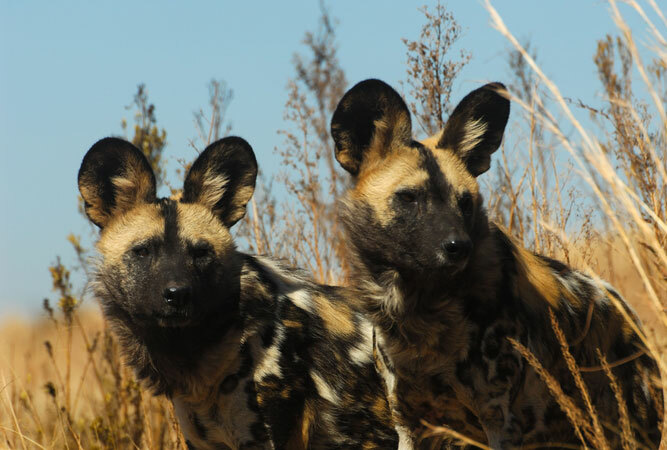 A wild dog census began in September 2014 and will run until June 2015. This is the Kruger’s fifth wild dog photographic census. Tswalu’s small pack of wild dogs disappeared over a course of years, believed to have been killed by local farmers after they possibly escaped the reserve. In July 2013 a pack of 12 wild dogs was flown from Thanda Private Game Reserve KZN and relocated to Tswalu. They were held in an enclosure for a month, before being released into the reserve. By July 2014, the pack was thriving, and had produced its first litter. This animal park is perfectly placed on the N2 between Knysna and Plettenberg Bay for visitors. Established around 10 years ago to protect a pack of rescued wolves, it has evolved into an awareness centre that offers a beautiful setting for visitors to meet gray wolves (also known as timber wolves), black-backed jackals and African wild dogs. A group of farmyard animals is also available for children to pet and feed goats, donkeys, cows and chickens. In December 2009 four male wild dogs from the De Wildt Cheetah and Wildlife Trust (now known as the Ann van Dyk Cheetah Centre) were released into Tembe Elephant Park. A couple of months later, the reserve introduced three females from Hluhluwe-iMfolozi. The pack produced seven pups. In 2011 another 14 wild dogs were introduced into Tembe, making the park the fifth reserve in KZN to reintroduce the country’s rarest carnivore. Madikwe, the fifth largest game reserve in the country, has a wild dog project that began by reintroducing six wild dogs into the park in 1994. Since then, and against all odds, wild dogs are now thriving in the reserve. Madikwe’s relocation is considered one of the more successful projects, with 20 puppies born to the reserve’s pack in 2012. Because they are used to safari vehicles the playful wild dogs seldom flee at the sight of a jeep, facilitating some great picture moments for visitors. Between 1991 and 2008, 154 wild dog puppies were born at the endangered species centre in Hoedspruit. Wild dogs in South Africa are limited to the Kruger, Hluhluwe-iMfolozi, Marakele, Pilansberg and Venetia Game Reserves, with some small populations in private reserves. Very few successful breeding pairs result. Which is why the Hoedspruit Centre plays a pivotal role. This said, it is difficult to incorporate captive bred wild dogs into wild packs. They have to undergo ‘rewilding’ with no contact with humans. Essentially a captive breeding facility and sanctuary for cheetahs, the former De Wildt Cheetah and Wildlife Sanctuary also breeds and releases captive-born African wild dog packs.